Marouanne Fellaini nearly sent Manchester United to defeat with one miscue in the closing minutes of their heated Premier League derby match with Manchester City on Friday. But Lady Luck still smiled on United on their visit to the Etihad Stadium. The Red Devils escaped defeat and held on for a 0-0 draw, still a desired result rather than getting blanked and all the flak for Fellaini’s attitude. If this derby was a boxing match, we can say both combatants fought very well but could not land the killer blow. 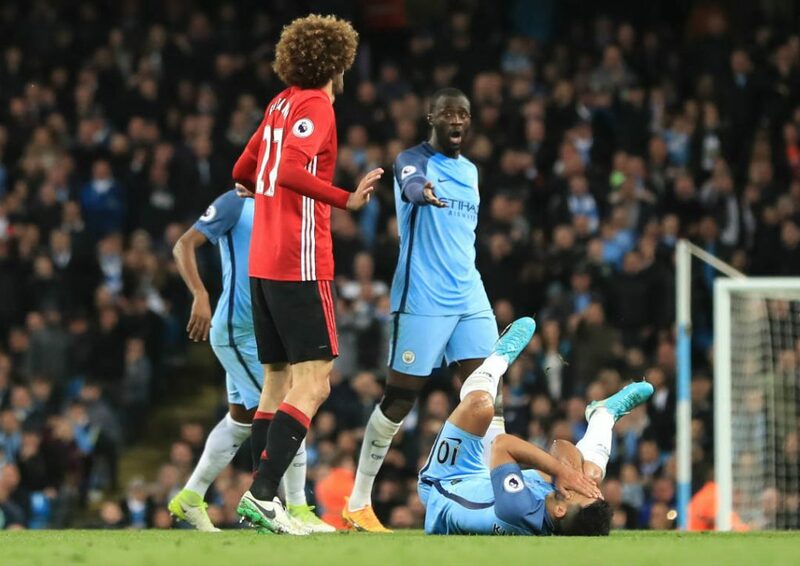 In the 84th minute, the afro-haired defender headbutted City striker Sergio Aguero and was given a straight red card by referee Martin Atkinson. Nineteen seconds earlier, Fellaini was also booked for a foul on Aguero. Jose Mourinho’s men though, hanged tough the rest of the way to pad their unbeaten streak to 24 matches, their longest run in a single top-flight season. The Red Devils also had to endure the absence of main man and top scorer Zlatan Ibrahimovic, who is out on injury. When the smoke of battle cleared, City remained at fifth spot, one point clear of United in the table 65-64 after 33 matches. The result also hampered both side’s bid of ending up in the top four and claiming a seat in the Champions League next term. However, City could be in the inside track to return to European football’s top tier due to an easier schedule ahead. With the crowd on their feet to give massive boost, City should have led as early as the ninth minute but Aguero missed from close range. United’s best chance to score was on Ander Herrera after he eluded a defender and met a free-kick at the back post but his header did not find the mark. Mourinho’s side tried to make inroads on their counter-attacks, while Pep Guardiola’s men tried to breach United’s defence in vain, summing up the second-half action. Gabriel Jesus replaced Fellaini and would have celebrated his first appearance since February 13 with a stoppage-time winner but to the dismay of United,, he was whistled for offside. Marcus Rashford led the United attack as Mourinho left Wayne Rooney on the bench but he could not click even as he worried the hosts’ defence led by Vincent Kompany. The City captain and defence tandem Nicolas Otamendi somehow made it hard for United attackers led by Rashford, Anthony Martial and Henrik Mkhitaryan who could not deliver despite showing fast pace. Aside from Ibrahimovic, United also saw action without Paul Pogba, Juan Mata and Marcos Rojo so Mourinho was blessed enough to halve the point with City despite a diminished attacking threat. After United equaled their longest unbeaten run in a single top flight season following the draw, Mourinho said his team’s resilience, playing with 10 men, was key in City being unable to upend them. Eventhough neither of the bitter rivals got the full three points, notching one points is still a “blessing’’ rather than bagging one. City and United should take the result as a positive. After all, their hope of catching a Champions League ticket remains alive.